Kevin adopted Louie (formally Duke, formally Harpo) in February 2015. 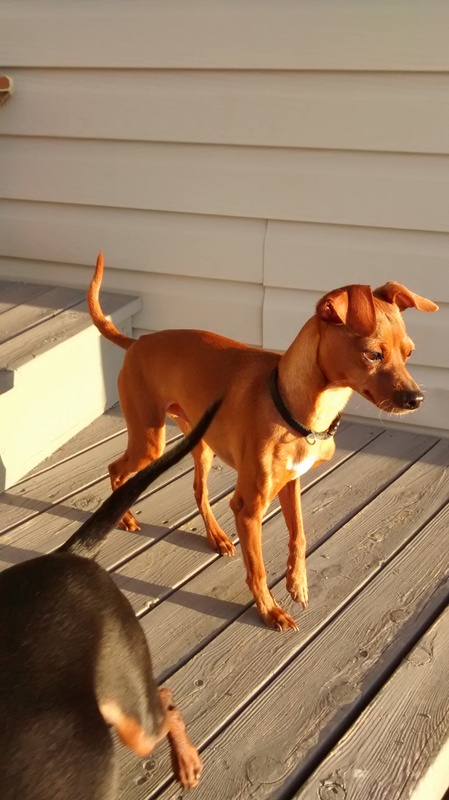 “He has gained all his weight back and has become the most lovable MinPin I have ever met. He and Georgie get along great and he has even warmed up to the neighbours. My only complaint is that my furniture is taking a beating from all the running and wrestling him and Georgie do. He has gotten over his fear of his food dish completely, he will even let you pet him while he is eating, rare for a Min Pin.I think he has become a very happy dog and we have become very happy dog owners.” Lovely!